This is our American flag with the Airman's Creed painted on the white stripes and the Air Force wings painted subtiley under the painted stars on the canton. 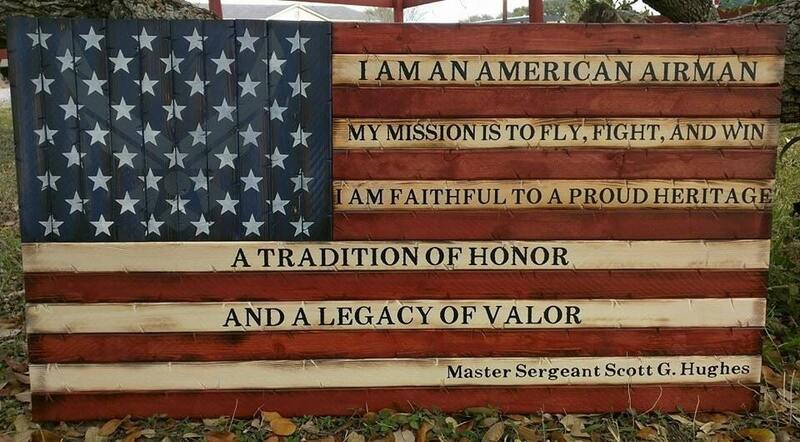 Our American flags are made with 23 pieces of individually distressed and stained wood. This measures approximately 19"x37", and has d-rings on the back for easy hanging. You can order this with an interior(inside from the weather) or exterior (outside in the the weather) in matte (softer, more rustic look) or gloss (shiny, and brings out the deeper colors) finish.